At Valley Health System every employee has the opportunity to positively impact the patient experience. Through efficiency, dedication, and kindness, our Support Services professionals provide convenience and comfort that can make a difficult time easier for the people we serve. We offer a variety of rewarding Support Services careers across our system, including careers in Environmental Services and Valley Dining. Our Environmental Services professionals create a positive first impression – and a healthier environment – for our patients. By ensuring the cleanliness of our facilities, team members help keep our workplaces safe and operating at their absolute best. Our friendly, diverse team plays a beneficial role in the daily lives of our patients and visitors. 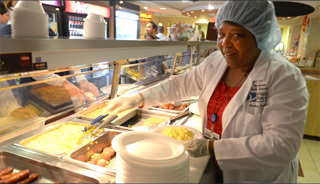 Valley Dining professionals help provide the highest quality food and nutrition services to our patients, serving more than 3,000 meals per day. Our diverse team of energetic individuals includes dietary aides, kitchen utility aides, registered dietitians, dining ambassadors, chefs, food service associates, cashiers, and clerical staff. They all work together to provide the best patient experience possible.